Are emotions, memories and stories as important for successful technological projects as 4K, 4:4:4 or IP? Yes, according to the InfoComm team who created the TIDE Conference. 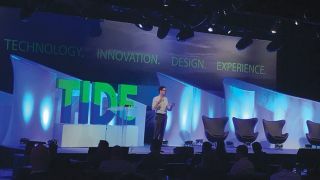 TIDE—an acronym for Technology, Innovation, Design, and Experience—was conceived and actualized to encourage AV stakeholders to re-imagine the technological possibilities and celebrate immersive storytelling. Since AV has risen in its profile as an enterprise essential, “it’s time to think differently about the industry,” said Brad Grimes, InfoComm International’s Director of Communications, “and focus on the importance of storytelling.” Integral to that paradigm shift is “viewing AV technologies as key building blocks for new kinds of solutions," he added. In TIDE Talks throughout the day, speakers shared their insights from the design, retail, entertainment, VR, AR, and science communities. All presenters underscored how storytelling has become a critical aspect of their organizational missions. Stories can shape how or if we connect, what we remember and how we make meaning out of our interactions.